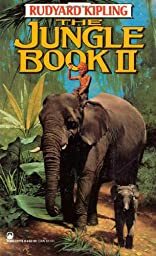 Jungle Books II was written by Rudyard Kipling. Jungle Books II was published by Recorded Books. A subject of Jungle Books II is Audio: Juvenile. About Patrick Tull (Narrator) : Patrick Tull is a published author and a narrator. Published credits of Patrick Tull include Desolation Island (Aubrey-Maturin), Blue at the Mizzen, The Wine-Dark Sea, and Jungle Books II.